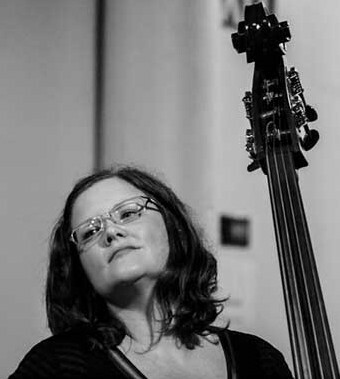 Lisa Mezzacappa is a multi-faceted person: on just the musical side, she's a bassist, a composer, and a band-leader several times over. Growing up in Staten Island, Lisa took up clarinet in 4th grade, and played with the Youth Symphony. She learned the electric bass in Junior High, dying her hair (the obligatory?) blue, all the while continuing with her "day job" of being an A+ student. She later majored in biology at the University of Virginia, and studied music under the tutelage of trumpeter John D'earth. Lisa moved to the Bay Area in order to pursue a Ph.D. in ethnomusicology at UC Berkeley, crossing paths with Henry Threadgill. She later toured with Donovan (probably the most high-profile of her gigs, and. at the same time, probably the least representative of her own music). Lisa calls herself an instigator, and runs almost half a dozen bands, collaborating with poets, sculptors and other visual artists. Her next project, in the works, is called "Glorious Ravage", an evening-length program with small orchestra, and with visuals by experimental film-makers, inspired by the adventures and writings of lady explorers of the Victorian era. If it can be dreamed up, then Lisa can probably make it happen. Luxury Item "An upright bass, ... or my KitchenAid mixer"